Here's one I've been thinking about writing on for more than a minute. In fact, I first played a selection from the album in question on my radio show on March 5th. The album in question is an EP called Places from Quebec City band Waving Hand who are a cryptic bunch to say the least. On their Myspace page they list the Band Members as "three guys," their influences are "St-Jean-Baptiste, St-Sauveur, St-Roch," and they play "Reggae / Religious / Electroacoustic" music. From what I've been able to discern, the first statement is true (the group includes Maxime Gamache on drums, Mathieu Gamache (Maxime's brother) on bass, and multi-instrumentalist Guillaume Chiasson), the second is questionable and the last is somewhat off the mark. Waving Hand do make electroacoustic music, and if their influences are to be believed, then it would stand to reason it's religious music as well, but it is most definitely not reggae. What it IS is a combination of glitchy, atmospheric numbers ("310," "Abandoned Church"), electro-punk that recalls LCD Soundsystem ("Bal Masque") and wonderfully constructed electro-pop. My favourite selection from Places, "The Man Living On The City Landfill Site" which you can hear on the CBC Radio 3 site is epitome of the electro-pop mentioned above. You can purchase the Places EP off their blog, and don't forget to check out the Waving Hand Myspace page. An actual album post will likely go up later tonight, but I just wanted to post the first video/single from what promises to be one of the top hip-hop albums of oh-ten, TSOL from London, Ontario rapper Shad. I thought his last album The Old Prince was pretty solid and the Fresh Prince Of Bel-Air spoofing video was on point, but rhyme- and beat-wise he's stepped it up a notch on TSOL. The album drops May 25th and Shad will be performing in Winnipeg on the 27th at the Pyramid as part of the Jazz Winnipeg concert series. Take a gander at "Yaa I Get It" and then go cop your tickets for the show. Maybe it's only natural that I dig Clinging To A Scheme, the new album from Malmö/Stockholm band The Radio Dept., considering I work in the 'radio department' at the University of Manitoba. More likely though, is the fact that crisply produced Swedish pop with some electronic flourishes is right in my wheelhouse [and yes, that's the second time in two posts I've used the term 'wheelhouse.' It's baseball season!!]. I first received Clinging To A Scheme in February from the good folks at The Musebox and I've gone back to the well repeatedly in the ensuing months. Starting today [April 21st], folks everywhere can start drawing water from that same well as Labrador Records is finally releasing the third album by this trio (Daniel Tjäder on keyboards, Martin Carlberg on guitar and Johan Duncanson on guitar and vocals), their first full-length since 2006. While Carlberg and Duncanson were the most important cogs in the machine on albums past, with a shift away from their shoegaze past towards a synth pop present Tjäder becomes the big cheese at the cracker factory. It's pretty evident on lead single "Heaven's On Fire" which bounces along on a jaunty keyboard line - it's irrepressible and will stick in your head for days. Carlberg and Duncanson do figure importantly on many of the tracks on the album though - opener "Domestic Scene" has a shimmery guitar line that absolutely makes the song. Elsewhere it's the interplay between the instruments ("A Token Of Gratitude," "Memory Loss") that recalls the band's past while pointing to their future. I've written about label-mates The Mary Onettes previously on Ear To The Sound and if you found yourself enjoying Islands, I'm pretty sure you'll dig The Radio Dept. You can check out the band's Myspace page or order the album off the Labrador site. While Bay Area label Ubiquity Records is the epitome of the relaxed West Coast vibe - dropping beats that seem crafted by and for stoners - they sometimes go outside their wheelhouse (particularly on the Luv 'N Haight imprint). Acts like Nomo and Clutchy Hopkins are indicative of the label's 'sound' and Shawn Lee's solo work certainly fits snugly within the fold, but his collaboration with gu-zheng artist Bei Bei He certainly raised my eyebrows at first. The gu-zheng is an ancient 21-stringed Chinese instrument and Bei Bei has been playing it since the age of seven. Despite her traditional instruction at a Hong Kong music conservatory, she started looking at incorporating jazz elements into her music (perhaps influenced by the great Dorothy Ashby?). Enter Shawn Lee who contacted Bei Bei and proposed a collaboration. After a brief in-person meeting, the two worked online and crafted the material on Into The Wind - a blend of new sounds and longstanding gu-zheng pieces. If Quentin Tarantino were looking to do another Shaw Brothers-style flick, he could begin by using this album as the soundtrack. Bei Bei and Lee have crafted an album that is cinematic in scope and deftly blends the new with the old. Gu-zheng proves to be just as flexible an instrument as the piano, with the added benefit of possessing a more novel sound. And be sure to check out Bei Bei's Myspace page, Shawn Lee's website and Myspace page. I don't often post about singles or videos here on Ear To The Sound because I envisioned the blog being entirely about highlighting new albums and you can't always judge (or prejudge) an album from the first single. That being said, occasionally I just know that a record is going to be great and the single is just wetting my whistle for the hotness to come. It's been four years since Aloe Blacc debuted on Stones Throw with Shine Through and that album was a gorgeous slice of neo-soul served sideways (take a listen to "Long Time Coming" on his website). Four years is a long time and a lot has happened sonically in the meantime, but it appears Blacc is poised to return big with his forthcoming album Good Thing. The first single is called "I Need A Dollar" and it is SOOOO good. Put me down for "eager anticipation" of the new record. You can download the single off the Stones Throw website here. Tim Crabtree (along with a handful of other Haligonian musicians) has crafted a gem of a little EP that came out of nowhere. On Tuesday when I returned to my desk at the station, Flicker was waiting among the piles of envelopes that had accumulated. Something about the handcrafted cardboard package and artwork caught my eye and it was one of the first discs I popped in to give a whirl while replying to a pile (mound? plethora?) of emails. It's a quiet record, but one that draws you in and demands your attention right from the opening notes of the title-track. Guitar and strings create a propulsive yet restrained pace before Crabtree's wispy vocals come in at the half-minute mark. I know that an epithet like 'wispy' can lead some listeners to dismiss a vocalist for not being weighty or substantial but Crabtree's voice still has resonance and muscle to it. I guess it might be the equivalent of bamboo - it bends but it doesn't break. The music meanwhile is 'folk' in the loosest of senses. While Crabtree lists Sun Kil Moon as an influence (and it can certainly be heard in tunes like "Bad Days"), I'd be more inclined to draw comparisons to fellow East Coast-ers Ghost Bees and past Ear To The Sound favourites Timber Timbre and Evening Hymns. There's an off-kilter approach to songcraft, never taking the easy way when a new path through the sonic bushes can be carved. The aforementioned "Bad Days" has some lovely electronic and noise elements mixed in with the insistent percussion. I hadn't intended to write a new post quite so hot on the heels of my Slow Club/Slow Six one yesterday, but in looking up info on Paper Beat Scissors I discovered that Crabtree will be in Winnipeg TONIGHT (April 15th) to play at Ragpickers so I thought I'd post this in the hopes that a few people might head down to the Exchange. AND I just got a call from Crabtree who is going to drop by UMFM today to record a few songs and an interview for an upcoming episode of my show. Time to get ready for that interview, but before I go, take a gander at the video for the title track. 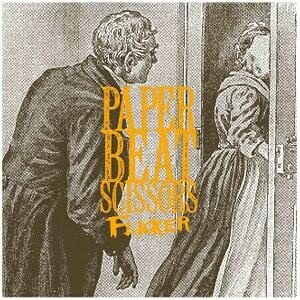 And be sure to check the Paper Beat Scissors Myspace page. Well, after a L-E-N-G-T-H-Y hiatus, Ear To The Sound is back. I had hoped to continue updating the blog on a semi-regular basis while I was on parental leave, but I gotta tell you - children are exhausting. Seriously, if you're a single parent I have nothing but respect for you. At the end of a day spent chasing a crawling baby, feeding, changing and entertaining said baby and housework I just couldn't find the energy to listen to much new music let alone blog about it. There were some albums I did manage to listen to while I was off and to get the ball rolling here on ETTS again I'm going to write about two that I've listened to repeatedly (yup, they've been out for a few months) and then we'll try to move on to more recent releases. While the two bands in this post have little in common sonically, they do share one thing - both have names starting with 'SLOW' which seemed fitting considering how slow I've been to update this blog. First off is UK male/female duo Slow Club. Their debut album Yeah So was released in England in 2009 but was re-released in North America earlier this year on Moshi Moshi Records. Balanced precariously between pop and folk the tightrope these two are on is twee with a capital T.
Take opener "When I Go" - wonderful harmonies, whistling(! ), delicate acoustic guitar and lyrics so full of the promise of love. The tempo and the jangle-quotient pick up on "Giving Up On Love" which lyrically is a curious flip-flop from the hopefulness of the lead-off track. Our second 'Slow' band comes courtesy of Western Vinyl, a label I've grown increasingly enchanted with and whose roster I've mentioned previously. Slow Six are actually a quintet from New York City that melds sweeping instrumentals with computer-manipulated found sound and avant-garde elements. Tomorrow Becomes You is the band's third album and it finds the group returning to Western Vinyl after their 2007 sophomore album came out on classical label New Albion. Things start off promisingly on the nine-minute "The Night You Left New York" which deftly employs the band's not-so-secret-weapon; violins. Composer Christopher Tignor along with Ben Lively both play the instrument and it lends a certain flavour to this 'post-rock' that other bands lack - when the upper registers of the instrument are reached around the 6:30 mark its a transcendent sound floating above the rhythm section. Picture a gull flitting about as waves crash into a rocky shore - that's the mental image I get as this song reaches its climax. With the instrumental nature of Tomorrow Becomes You the listener is bound to come up with all sorts of images and ideas in their mind's eye. Alternatively, this is the perfect record to put on while taking a walk and allowing it to soundtrack your peregrination. Close your eyes, take a listen to album closer "These Rivers Between Us" and see where the song takes you.